Abstract: The subject of the school concerns finite subgroups of groups of birational transformations of projective spaces. This topic is classical and goes back to the last quarter of the 19th century and it has its vivid renaissance in the last two decades. Two series of lectures will survey the most recent methods and results in this field. The lectures of Yuri Prokhorov will focus on Fano manifolds and will provide an introduction to Mori theory. The lectures of Jeremy Blanc will concentrate on finite subgroups of birational transformations of the plane. Program of the school: There will be 2 lectures each morning, 90 min each, followed by 90 min excercise session in the afternoon and contributed talks in the evening. Fano varieties and Cremona groups, by Yuri Prokhorov. Basic properties of Fano varieties. Examples. Del Pezzo surfaces. Introduction to Mori theory, Fano varieties in the framework of the MMP. Three-dimensional MMP. Outline of Mori-Mukai classification. Introduction to Sarkisov links. Examples. Outline of Iskovskikh classification (three-dimensional case). Application to the classification of finite subgroups of Cremona groups. Finite subgroups of the Cremona group in dimension 2, by Jeremy Blanc. Abstract: This course will be devoted to the study of finite subgroups of the Cremona group in dimension 2. This is closely related to the G-equivariant MMP in dimension 2, which has the advantage to be really easier than in dimensions higher (and in fact proved far before Mori statements). The course will describe the geometry on del Pezzo surfaces and conic bundles with a group action, and relation between all these models. If time permits, the case of non-algebraically closed field will also be investigated. Readings to lectures by Blanc. Dolgachev, Finite subgroups of the plane Cremona group Algebraic geometry in East Asia, Seoul 2008, 1-49, Adv. Stud. Pure Math., 60, Math. Soc. Japan, Tokyo, 2010.preprint version here. Bayle, Beauville, Birational involutions of P2. Kodaira's issue. Asian J. Math. 4 (2000), no. 1, 1-117.
de Fernex, On planar Cremona maps of prime order. Nagoya Math. J. 174 (2004), 1-28. Serre, Le groupe de Cremona et ses sous-groupes finis Seminaire Bourbaki. 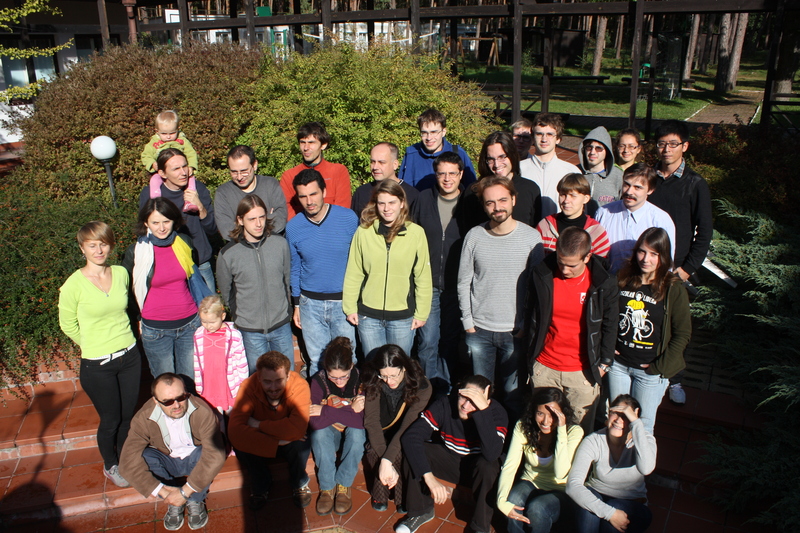 Volume 2008/2009. Exposes 997-1011. Organizers: Jaroslaw Buczynski, Jaroslaw Wisniewski, Institute of Mathematics, Warsaw University.